Physically this is a lightweight compact lens weighing about 425 grams, less than a pound. The outer barrel is comprised of plastic with a black rubber focus grip ring. It includes an Autofocus (FM) Manual Focus (MF) slider switch to flip between the two. It measures 2.9” x 2.86” making it quite compact. The 58mm ring accommodates filters. 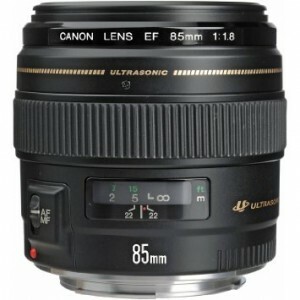 The lens itself performs excellently for the size and price of $370.00. The center sharpness is very good at f/1.8 the widest setting but the sweet spot of this lens is at the f/5.6 range where clarity from edge to edge is most pronounced. The falloff, diminishment of light on from the center of the frame to the edges, also stands up to the tests with minimal darkening or falloff detected even at f/1.8. Distortion is virtually non-existent in the Canon 85mm f/1.8 EF USM Autofocus Lens. Color fringe, the halo of color around objects especially on the edges of frames, is also non-existent. There are a few reports of barrel distortion, a slight curve to lines, but it is extremely minute and easily corrected in post processing. Flares and ghosts, are the spots and flares seen when there is strong background lighting like the sun and the Canon 85mm f/1.8 EF USM Autofocus Lens performs extremely well in this arena even at f/1.8. Naturally it performs better with smaller stops like f/5.6. The center sharpness at all stops is gorgeous with beautiful bokeh, background blur, with large f-stops. The auto-focusing is typical of Canon technology with lightening quick focus capabilities. The lens can focus faster than the human eye. The lens does not have IS or image stabilization but doesn’t really need one due to the rapid focus. Although the Canon 85mm f/1.8 EF USM Autofocus Lens has been in the Canon offerings since 1992, it still retains extreme quality. The f/1.8 works really well but overall the performance improves by stopping down at least one stop. The faults are minimal but to a discerning eye, things like barrel blur will be noticed at f/1.8. Overall this lens is ideal for portraiture with sharp center focus and beautiful bokeh. It has enough flexibility to not be limited to portraiture and can be used for much more. The size, performance and price make this an excellent prime lens to have on hand at every shoot.